To heat the main cooking area, the Elite uses four independently-controlled cast stainless steel infrared burners. Two 15K infrared burners heat the rotissierie section, and the single side burner packs a powerful 60K, enough to heat a large wok for stir fry vegetables or simmer a large stockpot of chowder. Halogen lighting for late evening cookouts is built in, and a rotissierie cradle is included. 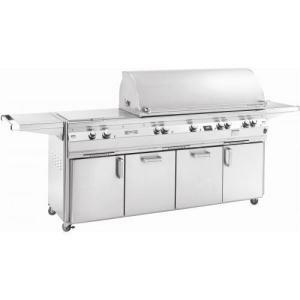 Every feature of this grill is more than you'd expect to see, from the electronic ignition system powered by 110V AC house current to the four zone digital meat and grill thermometer. Each of the four zones is divided from the others by heat shields for accurate control, and the monitoring system gives precise readings on each. All front mounted controls are stainless steel castings. With plenty of cabinet space in the heavy duty stainless steel housing and an independently heated smoker drawer for adding wood chips without mess, this weather-resistant and fully-warranted grill satisfies every grilling need.